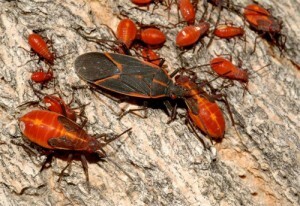 This time of year it is very common to notice an uptick of box elder bugs coming into your home or business. These bugs are trying to find a warm place to live in order to survive the cold Minnesota winter. Box elder bugs measure about 1/2-inch long, and they are mostly black with orange or red markings, including three stripes on the prothorax, the area right behind the head. They do not cause harm to humans or pets but they can stain surfaces inside your home or property with their excrement. Eco Tech, a leading natural pest control company serving the Anoka, MN area, specializes in the effective elimination of box elder bugs from the interior of your home or business. Our team has been in the pest control business for more than 15 years and uses organic and all natural pest control solutions that are safe for the environment, your family and your pets. Box Elder bugs feed exclusively on the vegetation and seeds that they find on the ground during spring and early summer, and then begin mating a few weeks after they begin feeding. By mid-July each year, these bugs migrate to female seed-bearing boxelder trees where they lay eggs on trunks, branches, and leaves. Box Elder bugs can also feed on maple or ash trees. Interestingly, there is no noticeable injury to these trees or disease that comes as a result of this feeding. As the weather cools, boxelder bugs push into cracks and spaces in and around your home, looking for warmth in order to survive the winter. They can be find in attics, around windows and eventually will come into your living space. If you see a few of them in your home, this may signal many more. Hiring Eco Tech for Box Elder bug removal is ideal because our team of pest control specialists can not only eliminate all bugs in your home, but we can also identify the entry point for these pesky box elder bugs and repair it so that no additional bugs can enter. Our company offers affordable pricing and does not require contracts, so you can be confident that you will get exactly what you pay for. We are also committed to using safe products for humans, animals and the environment. Call us at (763) 785-1414 for more information. As winter approaches, we can help you keep Box Elder bugs from invading your home!